One thing Liam Turner knows for sure is that he's not gay—after all, his father makes it very clear he’ll allow no son of his to be gay. And Liam believes it, until a chance meeting with James “Jay” Bell turns Liam’s world upside-down. Jay is vivacious and unabashedly gay--from the tips of his bleached hair to the ends of his polished nails. With a flair for fashion, overreaction, and an inability to cork his verbal diarrhea, Liam believes drama queen Jay must have a screw loose. An accident as a teenager left Liam with a limp and a fear of driving. He can’t play football anymore either, and that makes him feel like less of a man. But that’s no reason to question his sexuality... unless the accident broke something else inside him. When being with Jay causes Liam’s protective instincts to emerge, Liam starts to believe all he knew in life had been a convenient excuse to stay hidden. 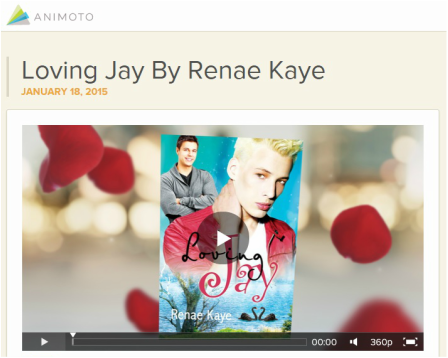 WATCH MOVIE: Link to Animoto and watch a 3 min movie. "Wow, what a great story about coming out and finding who you are." "I loved this novel, and would recommend it to anyone who wants a believable romantic read with humour and a few sniffs." "Liam and Jay were so frigging adorable and funny, I was totally and completely smitten from the moment I started reading. This book was so delightful, the humor was unapologetic, the characters genuine and endearing." "Recommended for an easy, light, fun read, if not for Jay alone!" "Loving Jay is a great story and one I plan on re-reading again"
"I had a big, silly grin on my face through most of the book."